Most of us understand the mechanics behind the increasingly erratic weather Earth is experiencing as the result of the magnetic influence of Planet X in the inner solar system. However, articulating this complex dynamic in layman's terms is not always a simple matter. To assist in explaining this dynamic more clearly, I've developed a visual representation of the magnetic influence Planet X has upon the Earth using a compass and another strong magnetic object. 1. Place a compass on a table top away from any metal objects and orient the compass until the arrow is aligned North. 2. Position a magnet or any other magnetic object on the table 2 feet away from the compass in the South direction and slowly move this magnetic object toward the compass. 3. As the magnet approaches the compass, observe the compass needle. It will either move toward West or toward the East depending on the polarity orientation of the object. 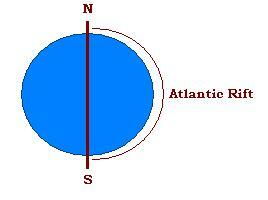 If the north pole of the magnetic object is pointing at the compass, the compass needle will move to the west. Use this orientation to proceed. 4. Now, with the compass needle deflected to the west by the presence of the magnetic object, suddenly pull the magnet away while observing the compass needle. Does it not swing back toward the east before returning to North? This movement, back and forth, to and fro and becoming increasingly more violent, creates turbulence in the atmosphere which translates into erratic temperature gradients mixing warm and cold air which ultimately manifest as unseasonable conditions and violent weather patterns. As Planet X draws nearer, this dynamic will increase until such time that the seasons have blended completely and the wobble becomes so severe that Earth falls on her side in a Static Lean to the Left, a sign the Last Weeks have commenced. The key to the Earth wobble many are now beginning to Notice, and the odd cold spot that lingers over Hudson Bay and in the waters off Nova Scotia, lies in the shape of the Atlantic Rift. We have stated that Planet X is skewed at least 45° along the Sun's magnetic flow lines, pointing its S. Pole away from the S. Pole of the Sun as it rounds this pole, thus putting a tug on the Earth's N. Pole which is attracted and tempted to align with Planet X in an end-to-end arrangement. The tilt of the Earth's N. Pole, leaning somewhat to the right to the side of the Sun Planet X is rounding, has created a false season simulating Summer in the northern hemisphere, were it not for the Constellations being out of place, an almost perfect mask for the approaching monster about to upset life on Earth as its current inhabitants know it. For those with keen eyes and clear eyes, for at least half the world from Japan to Ontario, an Earth wobble has become a reality. The Atlantic Rift is skewed to the West in the northern hemisphere, and then to the East in the southern hemisphere, following the deepest cleft between the continents as they rip apart during what is commonly called the Continental Drift. As wehave stated, this Atlantic Rift is itself a magnet as the tearing occurred during prior pole shifts and cooling magma was quickly aligned with the reforming poles, and thus becomes a third magnet encouraged to align with the Earth's core and Planet X during their encounters. At the point where the Atlantic Rift either faces or is in opposition to Planet X, this tugging to align occurs, creating the Global Quakes noted on live seismographs only during this past year, for the Earth, when Planet X has been in the vicinity. Why has an Earth wobble developed? When the Atlantic Rift is facing Planet X, high noon over the Atlantic, the tilt and lean of the Earth are tending to align side-by-side with Planet X where it rides on the Sun's magnetic flow lines, rather than the Sun, as the combined pull on the Earth core and the Atlantic Rift is a strong magnetic resonance. Due to the 'S' shape of the rift, leading with its southern edge more toward the East, this tug on the rift tends not only to tilt the Earth's N. Pole toward the Sun but also lean the N. Pole toward Planet X, as Planet X is approaching from the South, below the Ecliptic, from the right, and it grabs at the southern portion first, as nearer at hand. This gives Europe to Ontario a sunrise with a northern tilt, the increasing motion North of the Sun after the Solstice that has been noted. As this southern portion of the Atlantic Rift disappears around to the side of the Earth at dusk, this grip is relaxed and the Earth tends to align side-by-side with the Sun, moving its N. Pole back away from Planet X slightly. This gives the Western Half of the United States a sunrise location more in keeping with what is expected shortly after the Solstice, the Sun seeming to move South. This also moves the Hudson Bay and waters off Nova Scotia away from direct sunlight, thus the odd cold these regions are experiencing during their Summer. This wobble of the N. Pole away from the Sun and Planet X is most accentuated at this point, because the southern Atlantic Rift disappears and is entirely shielded from the direct grip of Planet X, being blocked by the Earth. As the southern portion of the Atlantic Rift approaches the dark side of the Earth, where it is again in line with the Earth's core and Planet X as magnets, creating magnetic resonance, the tug to align with Planet X again becomes strong, giving Japan the view of a sunrise moving North after the Solstice. But as the southern portion of the Atlantic Rift swings round to approach its dawn position, it is now more accessible to Planet X than at dusk. Approaching from the South, Planet X can directly grip this southern tip of the Atlantic Rift, so any wobble to align with the Sun is slight,tipping the Earth's N. Pole away from the Sun, is slight. Thus Siberia does not find itself with the lack of sunlight the Hudson Bay region does during its daylight hours. We mentioned, in the Whiplash ZetaTalk, that ricochet effects and twirling are possible. Twirling? What does that mean? Why is the cold spot to the west of Hudson Bay the coldest spot on Earth? That’s not the N Pole. What point is pointing away from the Sun most of the day? Are we going to develop a wobble? Are we going to suddenly lurch about so that the Sun is rising and setting in a place way off from where the public would expect? This is in your future, folks, but we will not give you the date. Tilting and leaning or aligning with the bully magnet that Planet X represents will occur, with ricochet effects and twirling possible to an extent we decline to reveal at this time. Cold spot just west of the Hutson Bay noted in May. And continuing, temps on Sunday June 20 in Alaska, 89°, in Michigan, 39°. Seems that most of the Northern Hemisphere is dealing with unusual warm weather. For Sunday they expect some 13 degrees Celsius over here in the Netherlands and other countries are dealing with warm weather too. The new ZetaTalk about the magnetosphere says "This is the reason for the increased violence of the wobble, as the PUSH away of the Earth’s N Pole is stronger." And also that the sun is setting to south. I am sure this is related to the warm weather, but with a more violent wobble and air masses clashing I would think that there is more going on now. Could the Zetas say something about this? At least 128 people have died during a two-week-long cold spell sweeping across northern and eastern India, news reports said. "An apparent contradiction is that while the Sun has been located too far to the south at sunrise in N America and setting too far to the south in Europe, implying that less sunlight should be reaching these areas, while much of the Northern Hemisphere has had warmer than usual temps for December. The Earth wobble primarily pushes the Earth’s magnetic N Pole away when the Sun is over the Pacific and the N Pole currently off coast of Siberia in the Arctic comes up over the horizon. This great push puts the PACIFIC under the Arctic air, while giving India cold spells. N America is to the side during this push while Europe finds itself pushed under tropical air as a result. By the time the globe turns so that the Sun is coming up over Europe, the globe has bounced back, rebounded from the push and in fact over compensated. Where Europe was pushed south during the polar push, it now bounces UP northward, so the Sun seems too far south. But the warming influence of the tropical air lingers. For N America, which lies to the side on this push/rebound, the effect is a pumping action. The jet stream is disrupted, and the air mixed. While the south may be having cool spells, the north may be virtually roasting, the opposite of what is expected." Thanks Howard. Now people can relate their dizziness to your graphs. Thanks Howard, this is great information! Thanks Howard, it all adds to the clarity. Thank you, but please do tell how are we to accurately discern day 1 of the 9 days of severe wobble? Patricia - Besides the sun being way out of position in the sky, coast lines will be assaulted with immense tides. "The severe wobble will bring a twice a day swing, which is not the hour of the pole shift but is a 12 hour movement. These tides can be expected to be hundreds of feet high, 200-300 feet, the worst being where a normal tide under the influence of the Moon is in process during the wobble." Great work, and a very simple to use demonstration for people who do not understand what is happening with the wobble. How far do you think we are from the "7 weeks prior"? I wish I knew, Patricia. Speculating that the Last Weeks will begin any later than March 1st of this year only invites complacency that can prove fatal. Don't hesitate to plan and take action. We won't know until PX is clearly visible in the skies. Thank you for your continued research and help Howard. This all makes since now with the wonderful maps and pictures. Awesome breakdown of a complex series of related events. Thanks so much.